Washington, DC, Oct. 1, 2018 – The National Business Aviation Association (NBAA) today unveiled its 2018 Business Aviation Top 40 Under 40, which recognizes young professionals working in business aviation for their career accomplishments and dedication to the industry. 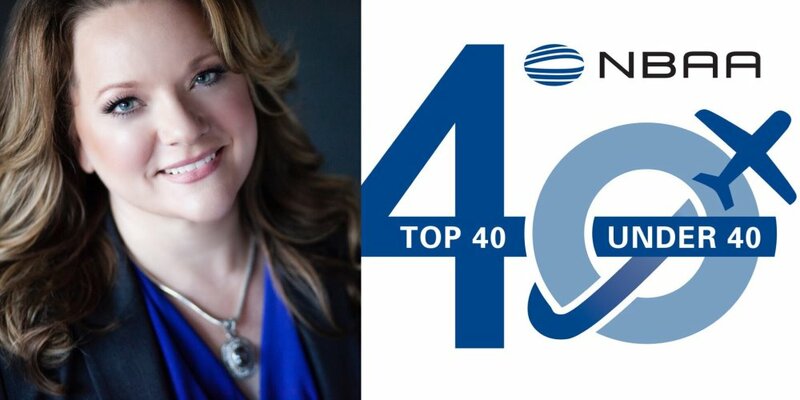 Galley Support Innovations is excited to announce that our CEO, Gina Radke, has been named as a Top 40 Under 40 in business Aviation. Mrs. Radke was recognized due to her work in business management. Gina and her husband, Wade, purchased a struggling Aviation product line in 2005 and has since grown that business to include multiple OEM’s, Private Refurb companies, airlines and multiple international customers. When Gina Radke attended her first NBAA-BACE after starting her aircraft interior hardware company, it was instantly clear that business aviation was a good fit for her entrepreneurial mindset. “I love business,” she says, “And I love that businesses aviation saves time, saves money and allows for face-to-face business to be done without the three-day travel period,” she said. When Radke isn’t drafting contracts or traveling worldwide to meet her customers, she’s likely giving back to the community. As a trade advisor for the International Industry Trade Advisory Committee, she works to ensure that the interests of small businesses are represented in trade policy. In her home state of Arkansas, she promotes aviation around the state and advocates for young people who age out of the foster system. “I’m always trying to make sure the little guy doesn’t get trampled on,” she says. Recipients will be recognized at NBAA’s Business Aviation Convention & Exhibition (NBAA-BACE), which runs Oct. 16-18 at the Orange County Convention Center, Orlando, FL. Specific events where they will be honored include the Young Professionals in Business Aviation (YoPro) Networking Reception on Oct. 16 and the Day 2 Keynote on Oct. 17. “At a time when the aviation community is as focused as ever on attracting and keeping tomorrow’s leaders and visionaries, NBAA is honored to have this opportunity to shine a spotlight on these outstanding young people, who are changing our industry in innovative and profound ways,” said NBAA President and CEO Ed Bolen. This year’s inaugural Business Aviation Top 40 Under 40 list was selected by NBAA’s YoPro Council, a group of business aviation professionals and NBAA staff liaisons working to build relationships between the industry’s emerging leaders. The council reviewed hundreds of nominations submitted from across the world and selected 40 individuals who represent the best of business aviation, including the broad diversity of disciplines within the industry. NBAA’s Top 40 Under 40 list can be find on the NBAA.org website. We Make It Happen! | ©2019 Galley Support Innovations | Cage Code: 43W68 | Developed by Elite Market Solutions, Inc.